I have this dish in one of my favourite New York restaurants, the Fatty Crab. They serve them in a Malaysian/Asian style with dried fish and so on, but they work equally well with European flavours such as crisp bacon and chives. You can vary the toppings and create your own little shooters. I’ve had some wooden boards made for the restaurant with holes for the eggs to sit in, but you could use coarse salt and just sit them in that. Grill or fry the bacon until crisp, then leave to cool and chop as finely as you can and mix with the chives. Bring a pan of water to the boil and carefully lower the quail’s eggs in with a slotted spoon. Simmer for 20 seconds, then drain and briefly run under the cold tap. 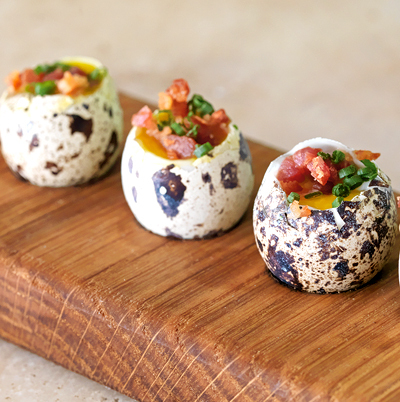 Spoon the sea salt onto a serving dish, cut the tops off the quail’s eggs, stand them in the salt and spoon the bacon mixture on top of each one and serve immediately. I was drinking in my basement bar one evening and suddenly thought it would be a great idea to turn a welsh rabbit into a fondue. It went down a storm, and we even serve it on the restaurant menu now. It’s perfect for a relaxed winter supper, or when out skiing, where a different cheese could be used. Melt the butter in a thick-bottomed pan, add the flour, and stir on a low heat for 20 seconds or so. Gradually whisk in the milk and stout to stop lumps forming, bring to the boil, add the mustard and season, then simmer very gently for about 15-20 minutes, giving it a whisk every so often. Add the Worcestershire sauce and double cream, and simmer for another five minutes, add three-quarters of the cheese, re-season if necessary, and add a little more cheese and mustard if it needs it. Meanwhile, toast the chunks of bread under the grill, then remove from the heat and scatter the remaining cheese over them. Serve the fondue hot, preferably on a table heater, with the chunks of bread separately, and with long forks or skewers. I don’t know anyone who doesn’t like pork crackling-and most butchers are happy to part with or sell you pork rind. This is our most popular snack and it’s now a permanent fixture. I’ve always loved pork scratchings, and we literally just can’t make enough of the stuff. Bramley-apple sauce helps cut the fattiness. Pre-heat the oven to 200˚C/gas mark 6. Cut the pork rind into rough strips about 12cm by 3cm. Place them in a pan of cold water, bring to the boil and simmer for about 15 minutes. Drain well, place on a baking tray and scatter with a tablespoon of sea salt. Roast for about an hour, turning every so often, until the rind is crisp. Meanwhile, chop the apple into chunks and place in a thick-bottomed pan on a medium heat. Cook for about 10 minutes, stirring every so often until the apple has broken up; you can give it a bit of a whisk to make it smoother if you want, but I like it quite chunky. Drain the pork in a colander, saving the fat to use for roast potatoes, and scatter more salt on while hot. Serve the crackling with the apple sauce as a dip on the side (eat on the same day).